Rationale: Chronic obstructive pulmonary disease (COPD) hospitalizations increase short and long-term mortality; multiple COPD hospitalizations track with even higher mortality. While comorbidities such as coronary artery disease (CAD) and congestive heart failure (CHF) are common in COPD, their contribution to mortality risk after a sentinel COPD hospitalization is unknown. Purpose: Assess the effect on mortality of comorbid conditions prompting rehospitalization following COPD exacerbation hospitalization. Methods: We performed a retrospective cohort analysis of patients hospitalized for COPD exacerbations in Pennsylvania from 1990-2010 using the Pennsylvania Health Care Cost Containment Council (PHC4) database. We included patients > 40 years old hospitalized for an acute exacerbation of COPD (AECOPD; International Classification of Diseases-Ninth Edition, [ICD-9] #491, 492, 496) by discharge diagnosis. Thirty-day mortality in patients with COPD hospitalization for acute exacerbation who were rehospitalized for COPD < 30days post-discharge was compared to those primarily readmitted for comorbid conditions. Relative risk of death after readmission was determined by diagnosis. 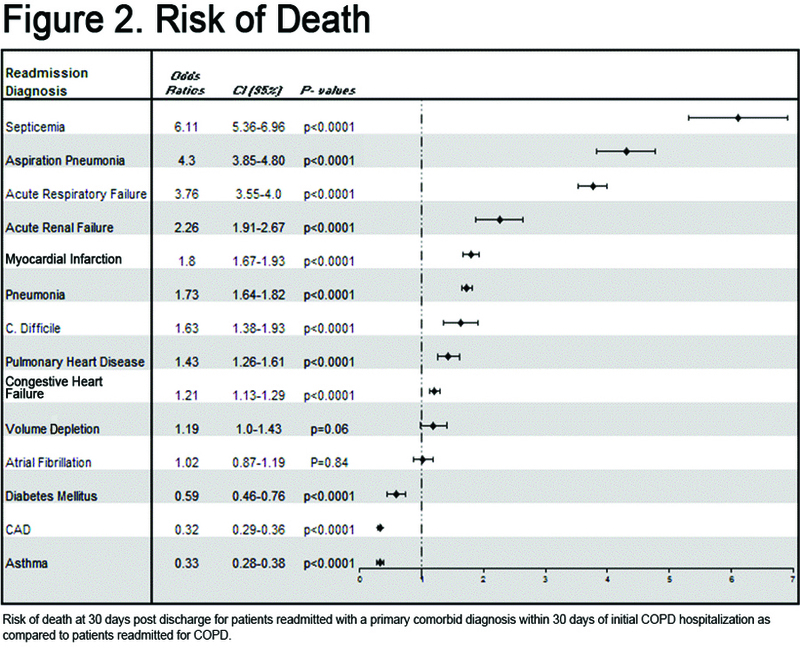 Primary end-point was mortality 30 days post-readmission for 14 most common non-COPD diagnoses, including heart failure, pneumonia, pulmonary embolus (PE), and myocardial infarction. Results: Patients were nearly 2 times more likely to die within 30 days when readmitted for pneumonia (p<0.0001) or myocardial infarction (p<0.0001) rather than COPD. Septicemia conferred the highest mortality. Conclusions: COPD patients rehospitalized for comorbid conditions such as myocardial infarction, pneumonia, septicemia or pulmonary heart disease (includes PE) were significantly more likely to die within 30 days than patients readmitted for COPD. Great emphasis is already placed on preventing COPD rehospitalization; however, more attention should focus on preemptive risk reduction for comorbidities in COPD patients. Funding Support: Funding provided by the Maxine Gitlin Lung Research Fund. Thirty-day readmission is a new area of focus since many patients rehospitalized soon after hospital discharge may have remediable factors that if appropriately addressed could improve patient outcome. This paper aims to examine the mortality impact of 30-day rehospitalization for comorbid conditions following an initial COPD exacerbation that required hospitalization. In concordance with previous evaluations, we hypothesize that short-term mortality will be increased in patients rehospitalized with comorbid conditions within 30-days post hospital discharge. We performed a retrospective cohort analysis of all patients hospitalized for COPD exacerbations in Pennsylvania from 1990-2010 using the Pennsylvania Health Care Cost Containment Council database (PHC4). The PHC4 database was used to identify patients with hospitalizations between the years of 1990-2010 who were hospitalized and carried a discharge diagnosis of COPD. We included Pennsylvania residents at least 40 years old hospitalized for acute exacerbation of COPD. The diagnosis included the primary diagnoses of the International Classification of Diseases, Ninth Edition (ICD-9) #491, 492 or 496. We examined if patients were rehospitalized in the following 30 days and noted the primary diagnosis for readmission by ICD-9 code. Primary end-point was mortality 30 days post-readmission for the 14 most common non-COPD diagnoses. Comorbid diagnoses included: heart failure, pneumonia, acute renal failure, pulmonary embolus, asthma, atrial fibrillation and myocardial infarction. We employed chi squared and 2-tailed t-tests to analyze the data. Odds ratios(OR) were used to compare 30-day mortality of primary comorbid admission to that of patients rehospitalized within 30 days for a subsequent COPD exacerbation prompting rehospitalization. The total number of COPD hospitalizations between 1990 and 2010 was 581,590. Almost 25% of patients (140,454) required rehospitalization within 30 days of an index COPD hospitalization. About one-third (48,281) of these rehospitalizations were for COPD while two-thirds (92,173) were rehospitalized for a comorbid diagnosis. Of those, the 14 most prevalent comorbid rehospitalization diagnoses were analyzed in this study. 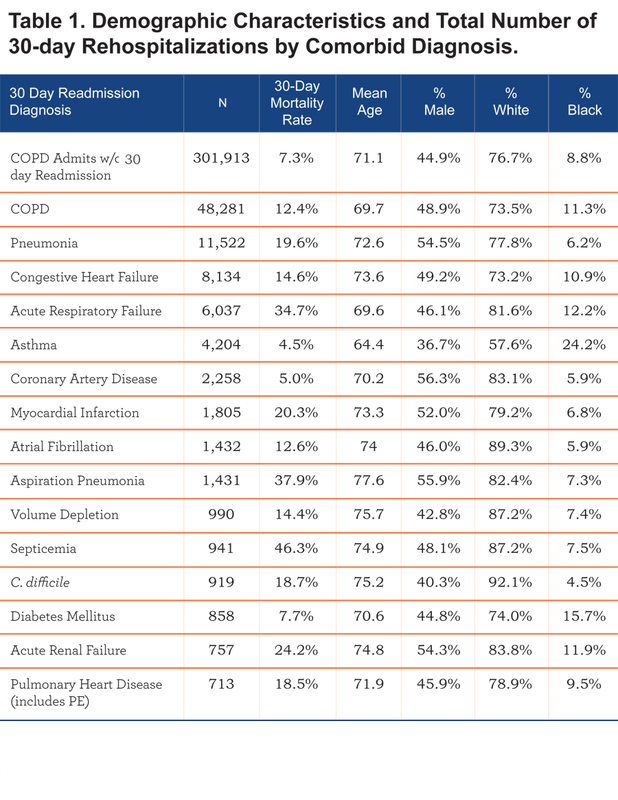 Total rehospitalizations and patient demographics are listed by comorbid diagnosis in Table 1. Patients hospitalized for COPD exacerbation without a 30-day rehospitalization for any cause had a 30-day mortality rate of 7.3 percent. The 30-day mortality was substantially increased if the patient was rehospitalized within 30 days and varied significantly by the primary diagnosis for rehospitalization. The 30-day mortality for patients rehospitalized for COPD within 30 days increased to 12.4% (OR=1.79). Thirty-day mortality rates for each of the comorbid diagnoses are listed in Table 1. Odds ratios were employed to compare the 30-day mortality rates of patients rehospitalized for primary comorbid diagnosis to those rehospitalized for COPD. The most common non-COPD rehospitalization diagnosis was pneumonia (n = 11,522) followed by CHF (n = 8134) and acute respiratory failure (n = 6037). The remaining diagnoses and number of rehospitalizations are listed in Table 1. Patients rehospitalized for comorbid conditions such as septicemia, acute respiratory failure, pulmonary heart disease (includes PE), myocardial infarction, aspiration pneumonia or acute renal failure were significantly more likely to die < 30 days from rehospitalization than patients readmitted for COPD exacerbations. Septicemia conferred the greatest risk of death within 30 days of rehospitalization (OR = 6.11), followed by aspiration pneumonia (OR = 4.3), acute respiratory failure (OR = 3.76), acute renal failure (OR = 2.26) and myocardial infarction (OR = 1.8). 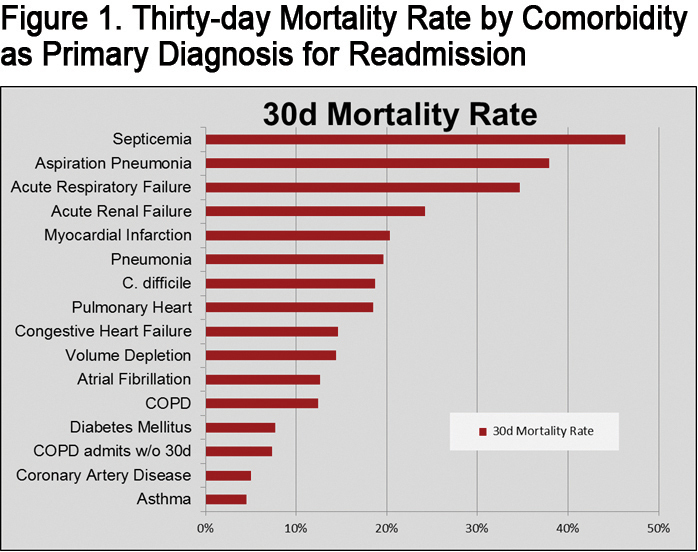 The 30-day mortality rates for all comorbid diagnoses are shown in Figure 1. Odds ratios are shown in Figure 2. Our study shows that rehospitalizations for comorbid diseases such as myocardial infarction, heart failure, pneumonia, aspiration pneumonia and PE confer the greater risk for short-term mortality when compared to recurrent hospitalization for COPD exacerbation. Though other studies have shown increased mortality in COPD patients with comorbidities, our study examines specific comorbid readmission diagnosis and short-term mortality after rehospitalization. Additionally, our study analyzes the prevalence of comorbid diagnoses as the primary rehospitalization diagnosis after initial hospitalization for COPD. Intuitively, several of the diagnoses show increased mortality if the comorbid condition affects the lungs such as acute respiratory failure, aspiration pneumonia, pneumonia, and PE in patients with underlying COPD. This is likely a result of COPD patients’ relatively low respiratory reserve. The consideration of acute respiratory failure as a comorbid condition can be debated as it may be a result of the underlying COPD. Using primary diagnosis codes as identifiers, it is difficult to distinguish patients with acute respiratory failure resulting from COPD from patients suffering from another condition that prompts the development of acute respiratory failure. Other groups have found increased mortality in COPD patients hospitalized with respiratory disorders other than COPD as compared to those without COPD. One study examined the 30-day mortality for patients hospitalized for community-acquired pneumonia (CAP) in patients with and without COPD8. The overall mortality for COPD patients hospitalized with pneumonia was almost 3x greater than patients who developed CAP but did not have COPD. Additionally these patients were also more likely to develop acute respiratory failure.8 Restrepo et al showed increased 30-day and 90-day mortality in COPD patients admitted with CAP as compared to patients without COPD.9Our data supports that those COPD patients rehospitalized with pneumonia are at increased risk of death relative to patients rehospitalized due to recurrent COPD exacerbation. Our data demonstrates a tendency to identify comorbidities that are associated with an older population. Not surprisingly, aspiration pneumonia occurred in an older population with a mean age > 77 years. While there was some gender and race predilection to be also seen with other comorbidities it remains unclear if this confers any particular clinical significance. Given our analysis, we argue that the greatest potential for mortality reduction lies in identifying the rehospitalization diagnoses that may represent a missed or inadequately treated disease process during the index admission rather than a novel disease process. For instance, the development of a myocardial infarction after COPD exacerbation may relate to the physiologic and metabolic stressors that occur during COPD exacerbation.5 Given the similarity of symptoms and the ease with which chest pain can be attributed to COPD, clinicians should hold a high index of suspicion for myocardial infarction in these patients. In addition, treatment rendered during the index admission may contribute to some of the rehospitalization diagnoses. For example, extended use of antibiotics may result in C. difficile infection or overuse of diuretics may lead to acute renal failure. Given the data shown, it is clear that a great emphasis should be placed on controlling exacerbations of COPD as well as managing other comorbid diagnoses for hospitalized COPD patients. Also, thorough evaluations should be performed to prevent readmission for the most deadly and potentially preventable comorbidities like septicemia, aspiration pneumonia, myocardial infarction and acute renal failure. This study has several limitations relating to the PHC4 database. For instance, the diagnoses were obtained based on billing codes for primary diagnosis. These can be inaccurate at times. In addition, the database does not allow for a more thorough review of patient-specific characteristics at the time of discharge from the index admission. For instance, discharge medications were unavailable as were vital signs, radiology and other detailed clinical test results. The diagnosis of acute respiratory failure is also somewhat ambiguous since the cause for respiratory failure could not be definitely ascertained. Acute respiratory failure could result from an inadequately treated COPD exacerbation, pneumonia, pulmonary embolism or another unspecified lung condition. Still, it is likely that in many cases it represents a process different from COPD that could have resulted from a missed diagnosis or inadequate treatment. Additionally, the PHC4 database only includes rehospitalizations for where the original hospitalization occurred. However, the sheer number of hospitalizations analyzed in this dataset outweigh these limitations. We show that COPD patients rehospitalized for comorbid conditions such as myocardial infarction, pneumonia or acute renal failure are significantly more likely to die within 30 days than patients readmitted for recurrent COPD exacerbation. More attention should be focused on preemptive risk reduction for these comorbidities in COPD patients to decrease morbidity, mortality and need for rehospitalization. The authors have no conflicts of interest to declare including financial and consulting relationships.